All Desks, Arches, Room Dividers, Light Fixtures, Bar, Decorative Elements, Secret Door Bookcase, Tentacle Couch, Coffee Tables, Side Tables. Individually customized desks built with wondrous designs. 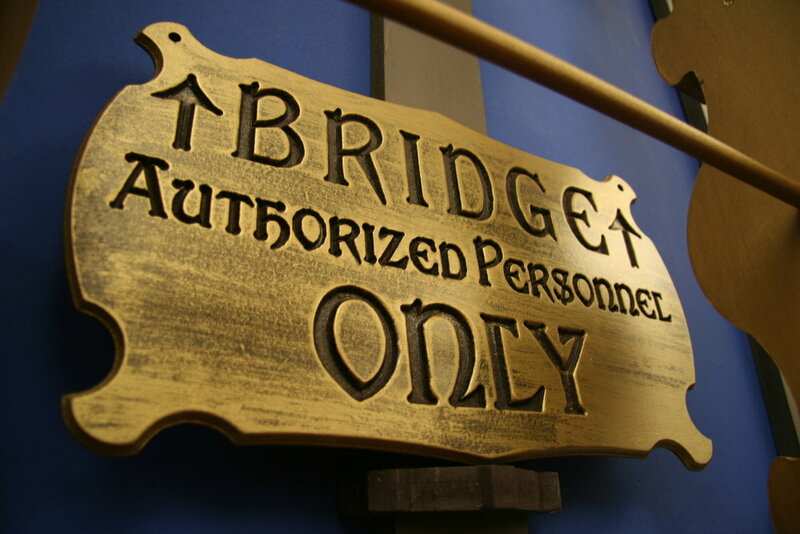 Originally, the back wall was going to host a mock submarine bridge, but Three Rings did not want to sacrifice the work space for a non-functional design element. So, we decided to make a fake ladder and ceiling hatch. The client desired a giant map on the wall, so we made a special frame for the largest one we could find. To complement the map, we installed salon-inspired picture frames on the adjacent wall. We referenced Victorian photo books, appearances of The Nautilus in film and, of course, Jules Verne's 20,000 Leagues Under the Sea. We snuck in some electrodes and intakes that spin. We designed this bar from the depths of our imaginations. We aimed for something cool and unique. In designing the space, we divided the space thematically. 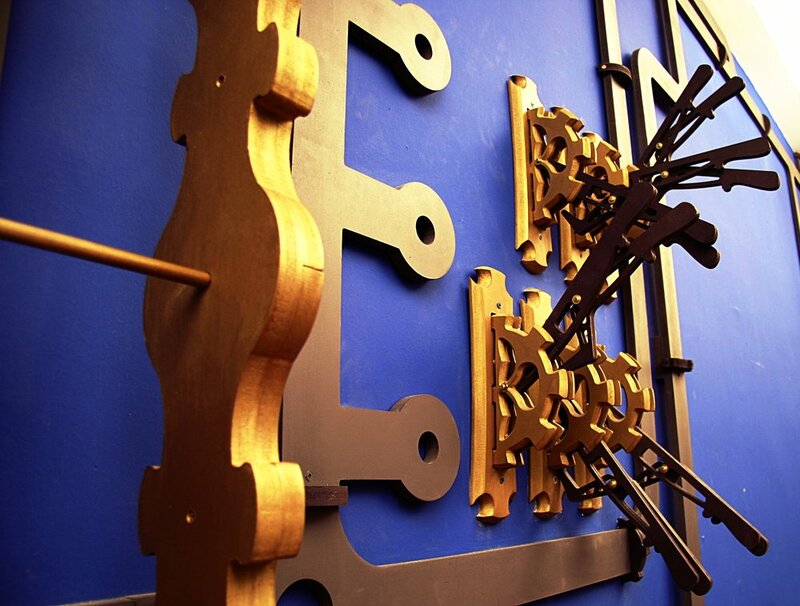 The work spaces are mechanically themed, with levers and electric diodes scattered about, representing an engine room and other inner workings of a ship. This screen's design was inspired by Three Rings' Puzzle Pirates game and features a sunken ship, octopus and a pirate flag. Another screen riffs on Three Rings' Bang! Howdy. Pay special attention to this plain old bookshelf. The bookshelf opens up into a secret room! 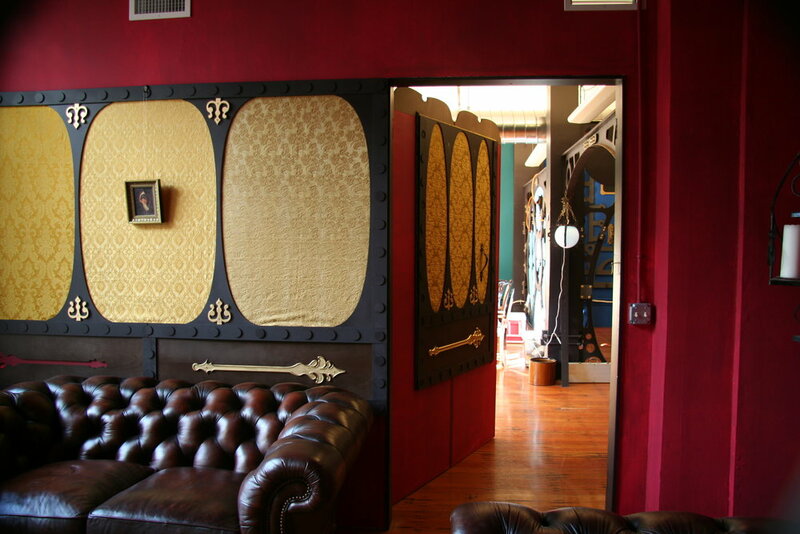 The secret room's furnishings, big, plush leather sofas, were acquired used from a Craigslist poster. Seating in the gaming room is provided by the plush tentacles of an attacking octopus, which look as though they are being forced into the sub from the deep depths of the ocean. Three Rings Design was expanding, taking over a large empty room. They needed desks, they needed a hang out space, and, as a small independent video game design company, they needed it all to be really interesting and fun. A space to gain and keep talent. A fun place that employees could feel a proud connection to. We pitched several crazy design concepts, and finally landed on a homage to Jules Verne 'Twenty Thousand Leagues Under the Sea'. We created underwater portholes and Engine silhouettes as space dividers, a Victorian looking pool table and a "nautilus" themed bar in the hang out space. Drapes were hung over the windows and decorative covers placed on the hanging florescent lights. 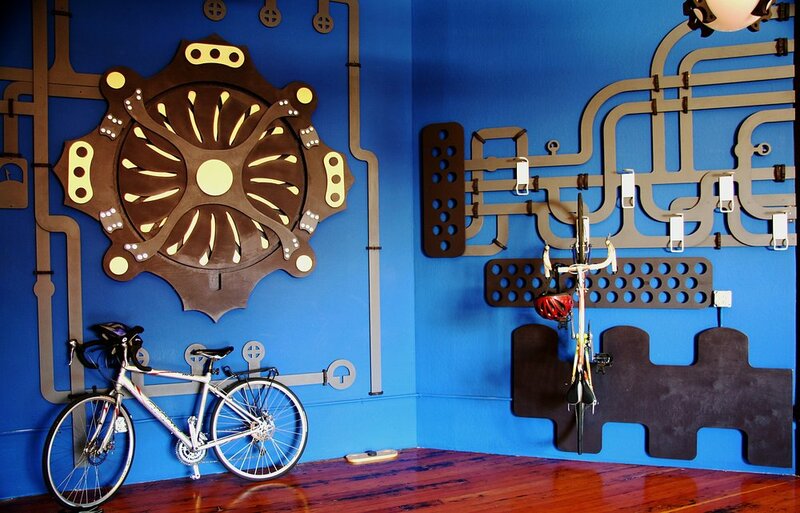 We designed a huge "octopus attack" couch and turned the bike storage area into the "engine room". Decorative details were put in where ever we could fit them, and the staff of artists helped out by drawing many of the elements. We even worked with each artist to design their own desk. We created a template desk that allowed for different designs to be created out of the back and sides. The staff had a blast helping with the project, and in the end were invested and proud of the space.